Emergency! Red Alert! Patty please advise! Patty please respond! All Patty report to duty stations! Patty ASSEMBLE!!! A seemingly-dramatic recreation has broken out in the San Fernando Valley, threatening the lives and livelihoods of simple farm-folk. All this seen through the eyes...of our narrator. Not so much through young Patty Garmen as the title might suggest. Yes, contorted irks may occur to the confused stylings of announcer Don McNamara, who apparently read the 'gag' copy all through the recording session. Kids, though, will feel highly empowered towards the end of this short.This was the case for many atomic-era educationals. Why the child in you will feel the call to duty against the flaming red menace that endangers all.The slavic, borscht-eating inferno. The billows of vodka-swilling godlessness. Needing to be stamped out and doused upon by big, American hoses! 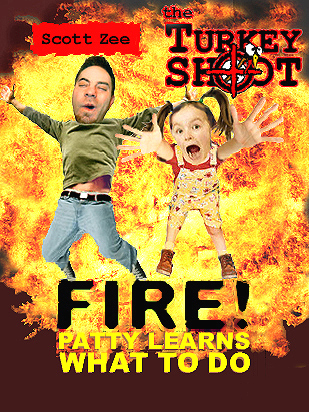 But, then we'll all learn Patty's big lesson,..and fart at it. So grab your axe and keep down low. 'The Turkey Shoot' is about to roll from the station. Oh,..and watch-out for the backdraft. I think it's like..fire..or..something.